Sabaja Dr’s Beer House was not big enough to fit all the people who joined the sixteenth edition of BarCamp Prishtina which took place on thursday evening. 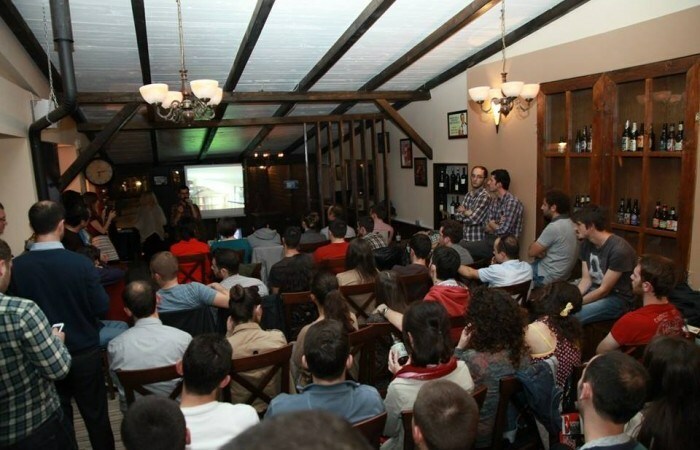 Networking, broad discussion and interactive presentations characterised this special edition of BarCamp Prishtina. Alex Butler, Muzafer Shala, Fatos Sylaj, and Valon Sopi were the guest speakers who shared their experience and thoughts with all participants. The importance and history of beer was the starting point of Alex Butler’s presentation, the guy who came from United States to start a business in Kosovo. He shared with all barcampers his experiences of home brewing beer in the United States before coming to Kosovo while explaining the process in details. Being asked for the biggest challenges which he faced in Kosovo, Alex mention the difficulties he had on running a totally new business idea for the first time in a new country. “It was challenging to find and build all the stuff I needed just to start the work. Finding the right water, having electricity and others”, he said. On the question on how they break through the market Alex answered: “We are not in the market to compete with Birra Peja and others because we are not producing that much. Our mission is to make small batches of quality for people who enjoy beer”. The Dean of Mechatronics Management at the University for Business and Technology, Muzafer Shala, brought to BarCamp Prishtina interesting presentation on mechatronics. The combination of mechanical engineering, electrical engineering, control engineering and computer engineering were the core subjects he treated on his presentation, while bringing different examples for the audience. Shala also played a video of automated production and related his presentation to Sabaja. Robotics as a new field in Kosovo together with mechatronics, and UBT being pioneers in this field were other points of his presentation. In the other hand, Fatos Sylaj talked about one of his projects at UBT where they created a robot which would play the piano itself. Dancing and musician NAO robots were the best way to end the inspirational presentation. A graphic designer focused on bringing new products on web development industry, Valon Sopi brought to BarCamp Prishtina the newest project of BoldUnderline. Goodwerp came when Valoni’s company had to use more than one tool to manage their projects therefore they decided to work on a concept which could be used by small design firms and others to manage their daily tasks and projects. This project has combined what every other product missed in some way. It is made in Kosovo and they want to keep it here. They are not afraid of the competition because their market is focused in a number of people who need every feature of their platform. As Valon explained, they don’t have a high budget and that’s why they are not spending money in marketing. Answering the question on investors he explained: “We don’t want to have board of investors deciding what are their desires. We actually want to let users to decide what are their needs.